Quality sleep is an essential part of a productive and more concentrative day. It takes more than just leading a healthy lifestyle and starting on a sleep routine. A crucial role in ensuring you enjoy a restful sleep is the choice and quality of your bedding. One of these elements is the comforter or in other words what most people know as the duvet. This mainly comes into play during the colder months of the year where extra covers are needed to help keep you snug and warm. If you wish to get the most comfort of your bed, here are five great down comforter options perfectly designed to keep you warm, comfortable and sleeping plush. Premium quality fabric: The comforter is made of 100 % genuine Egyptian cotton fabric cover. Hypoallergenic: The comforter fabric resists allergy-causing agents to protect sensitive skin. Premium baffle box design: This feature prevents the duvet from shifting keeping it in the best shape for a comfortable sleep. This Egyptian Bedding Siberian goose down comforter has a 100 % Egyptian cotton cover. This is designed to hold up for an extended period while withstanding regular use and cleaning. It has a 750 + fill-power and has a fill weight of about 70 ounces. These features show the guarantee to enjoy warmth and comfort all through the night for a more extended period. The comforter cover has a thread count of 1200 which shows incredible strength and versatility of the material. This also contributes to the continence of the filled fiber for a long time despite regular use. One of the factors to consider when selecting a comforter is the nature of the cover. This particular one is hypoallergenic to ensure you are comfortable and free from skin irritants and allergens. Available in two sizes: Queen and King. You probably know how hard it is to find a king size comforter that guarantees quality and durability. 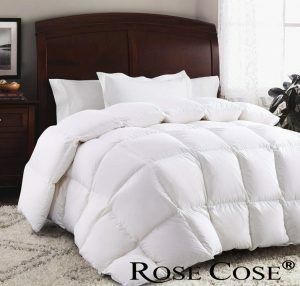 Now, with this goose down comforter, you can be sure of the right coverage for your king or California king size bed. The comforter measures 106 inches by 90 inches for a nice heavy drape. Not only does the comforter come packed with comfort but also brings luxury to your bedroom. Aside from the design, the comforter utilizes premium baffle box for higher loft and extra warmth. The loops on the duvet are designed to strengthen the cover and prevent the comforter from shifting over time. The double stitch design used for the comforter ensures down leakage does not occur and the duvet lasts a long time. If you are looking for a comforter that keeps you warm and doesn’t overheat, then this might be the right one for you. Also, if you are always getting those that shed and leave a messy bedroom every other day, then this will be a lifetime fix to the problem. You might want to keep it away during the hot season but will come in handy when the cold nights kick in. High-Quality material: The comforter is made with premium cotton for the cover and genuine goose down for the fill. Baffle box design: This feature ensures the comforter stays in place and prevents clumping and sifting of the filling inside. Luxurious: The comforter not only brings warmth to the bedroom but packs up luxury and style with the bright white cover and unique design. You agree that quality comes first when buying all bedding leave alone comforters. The choice of material and the construction determine if the bedding lasts an extended time with minimal care and maintenance. This particular comforter promises to serve you for a long time while enjoying the benefits of a goose down comforter. It has a 100 % cotton shell which acts as the protective fabric for the inner filling. 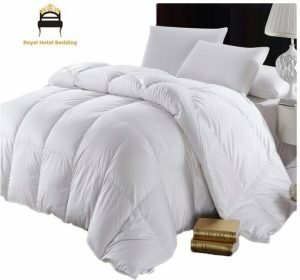 Also, the comforter features 93 % white goose down and 7 % goose feather for the filling. This material combination brings about a lightweight but incredibly warm duvet for the cold months of the year. The filling fibers are all natural to ensure a lasting effect while protecting you from synthetic fibers that might cause skin irritation. In addition, the comforter is filled with 30 oz. Premium goose feather down 800 fill power. The features above mean that the duvet gets a fluffy yet sturdy structure. These are essential in keeping you warm without feeling the bulk of a heavy quilted duvet. In turn, all these benefits translate to a comfortable night sleep and a relaxing morning the next day. Talking of comfort, the cover comes in 100 % cotton material with a 700 thread count. This ensures a soft touch on the skin while ensuring it lasts as new with the right care. It’s available in sizes: Twin, Full and King. Since this comforter has a baffle box design, the filling inside does not clump or shift over time. Also, the quality stitching to secure the filling keeps everything intact for a long time. This comforter is for you if you are looking for a light-weight comforter for the cold months. Also, if you are looking for a solution to shedding comforters, then this one will work well for you. Premium material: The comforter features high-quality finely selected cotton for the cover and with 100 % natural goose down fill. Hypoallergenic: This comforter utilized materials that are free from allergen causing radicals to ensure comfort and safety for everyone. Quality Construction: The comforter utilizes state of the art stitching and processing to ensure it lasts a long time with minimal care. One of the features to guide you when getting a comforter is the quality of the cover and the texture of the fill inside. This two are the determinants of where the comforter will last in the right shape for years. On this note, it is essential to understand the tags and learn what different material combination men. For this comforter, the cover comes in 100 % cotton featuring a thread count of 1200. This shows that the fabric has the strength required to hold up the fiber and keep the duet in shape all through. The comforter utilizes a 750 + fill-power with 42 oz. fill weight all in natural goose down. Also, it features down proof with tabs which is a guarantee of quality and durability. The duvet is luxurious for the bedroom and is designed to last you comfort all year round. It is light in weight and has a fluffy finish for the warmth required when the cold creeps in. The size also matters since you do not want to get one that doesn’t offer the coverage needed. This one comes in three different sizes that are the queen, twin and king. The king size measures 106 inches by 90 inches which is large enough to give you the nice drape on the sides. The queen measures 90 inches by 90 inches and equally has the expected drape around the bed. This comforter will work for you if you are looking for a hypoallergenic down-fill comforter to last you a long time. It is also suitable for you, if you prefer lightweight but warm comforters to use all year around. It might be too warm when the temperatures are high but will come to your rescue when winter comes. Premium construction: The comforter is designed for use all around the yea; thanks to the ventilated goose down fill for comfort. Hypoallergenic: The comforter cover is designed to ensure you sleep comfortably without worrying about the risk of developing allergies and irritations for long periods of use. 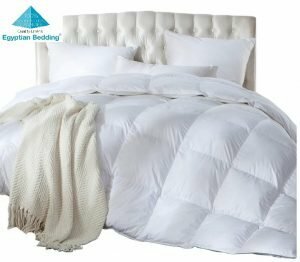 Lightweight: Since this comforter is designed for all seasons, it is not bulky but brings about the warmth required for a comfortable night sleep. 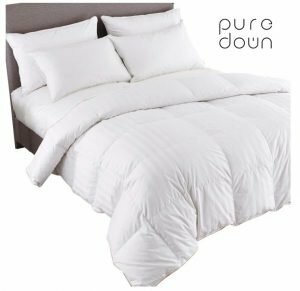 This Pure Down all-seasons goose down comforter is the ultimate choice for you if you need a single fix for all the seasons. It is designed to ensure optimal breathability which ensures you sleep cool when it is hot and warm when the temperatures hit low. This benefit comes from the quality construction of this comforter. It uses 75 % white goose down ventilated layer for a comfortable night sleep. Also, there are other elements that contribute to its suitability for use around all seasons. One of these is the lightweight nature of the filling which also contributes to wicking away excess heat during warm months. The filling is made up of 42 oz. premium goose down feather which is not only lightweight but also durable. Also, the high-quality cotton cover with a 500 thread count ensures comfort. The comforter is built to last a long time in the right condition. It has a double stitch design for securing the filling inside. Also, the box design ensures the filling remains well in place and does not clump or shift. This is a crucial factor when searching for the right comforter since the filling, cover, and stitching matter the most. This duvet is available in sizes: Twin, Full/Queen, King/Cal King and all drape beautifully around the bed which also contributes to the aesthetics and comfort of your bed. The comforter is for you if you are looking for one to use around all seasons of the year without having to keep it away when the temperature changes. Also, it is for you if you are chasing after quality, durability, and comfort in a single comforter. Premium Material: The comforter has a 100% cotton fabric for the cover which is a guarantee of quality and durability. Quality Construction: The stitching technique used for this comforter ensures lasting strength despite regular use. Allergy-free: the comforter is hypoallergenic which ensures that it is comfortable for use by everyone without worrying about allergies. As always, the first guiding factor in choosing a comforter is the quality of the cover and the filling inside. As much as it can seem a challenge identifying premium materials, the tags provided usually give an overview of materials and quality used. This comforter for Royal Bedding comes with a 100 % cotton cover for strength and durability. Available in a multitude of sizes: Twin/Twin XL, Full/Queen, King/Cal-King, California-King/King. 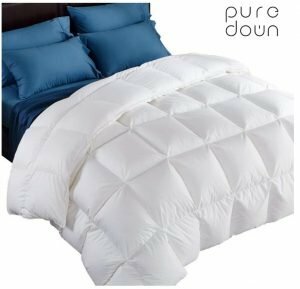 It is a luxury down comforter with a 750 + fill-power using high quality down feather. The filling is 75% down and 25 % small down feather. The 60 oz. filling blend is designed to deliver the warmth required while keeping you comfortable all through the night. The down feather is hand-harvested for premium quality, strength, and durability. With this, you can be sure of a comforter that will last long with minimal care. The cotton cover contributes to the durability and the comfort. It is designed to last long with the double stitch design for secure finishing. Also, the cotton cover comes with a thread count of 500 which bring about a soft yet sturdy material for extended use. It is hypoallergenic to keep you safe and free from allergy-causing radicals and micro-organisms. The design of the comforter contributed to its quality and comfort as well. This one has the baffle box design which is known to keep the filling in the right condition for longer. It prevents clumping or shifting of the fiber which is common with most low-quality comforters. If you are stuck finding a temperature-regulating down comforter that feels like sleeping on a cloud and with a filling that never shifts, then this down duvet could be the right choice for you. It has a fluffy feel and feels light for maximum comfort all night long. What’s more, it works for all seasons; thanks to the premium nature of materials and quality construction. Comforters, just like other bedding are crucial elements for quality sleep and restful nights. These described above are some of the best available on the market. They promise not only durability but also comfort and warmth. And, since these are the features that make each worth a buy, they all pass the test.